1-Good afternoon, Blaze, how is everything going? Hi, i am great. I am touring in Russia at the moment with Paul D’ianno and after that I will start on my European Leg of the King of Metal world Tour. I will be doing a massive 60 shows all over Europe to promote my new album “The King of Metal” and will be doing 5 shows in Spain! 2 - Would like first thing to thank you on behalf of maiden.es and for giving us this interview for all your Spanish fans, is an honor for all of us to share a few words with Blaze Bayley, a man who was part of one of the greatest of all-time Heavy Metal bands and soon bring to light a new album entitled "The King of Metal". 3-Starting your new album, "The King of metal", how it occurred to you this name and what you inspiraste? The King of Metal is the fan who buys the CD, the t-shirt and the concert ticket. The fan that makes it possible for me to continue to do what I love, singing and songwriting and performing. The fans are the real Kings of Metal so that is who this album is dedicated to. 4- Have advanced that to compose a theme of this album, you've inspired by the legend of God, how was that? could you tell us, if you want to, what is the point? It is not really about god, the story makes sence once you will see all the images of the album but here is the explanation: The man on the cover does not want to be a king, he is not proud or arrogant. The crown is of barbed wire. It is used to make fences to keep animals. It has no value. It is to ridicule him that's why they put it on him. His humanity and even his human body is almost gone, replaced by artificial mechanical limbs. When you open the booklet and read my words and see my robot singer survive against all the odds to find his way back home and sing his song to the convict in his prison cell. To show that man who has reached the lowest point in his life to tell him there can be a life for him. 5 - You could tell us a little how the recording of the new album, has gone has composed all the new songs from the album? Where are you recording? I seem to remember that for the edition of the same will be carried out through Blaze Bayley Recordings, as well as the two last studio albums. Yes, the album will be released and produced by Blaze Bayley Recordings, so me. I have written the album with the help from Thomas Zwijsen. After those intense few weeks, we went to Italy and recorded all the instruments with Claudio Tirincanti, Andrea Neri and Lehmann. Them we recorded the vocals in Holland and most of the mixing happened in Barnyard Studio’s from Steve Harris with Tony Newton. Rick Plester from the USA did a guestperformance on one of my songs and mixed a few songs too. The mastering was done with Jase Edwards. 6 - Something that bites us, how is that work at the home of Steve Harris? was it the own Harris who has been in the process of mastering or mix and who proposed you it? This gives us to believe that your relationship with Harris are super good and it is something, is it, really? at least for us, we are happy to amount. I am still friends with Steve Harris, yes. He offered me in the past to do some of the albums i have done in his studio but I could not afford to pay the guy, even though they were offering me a very low price. Now I could so I asked Steve and he said yes again. It was an absolute pleasure to work there again, top quality equipment and Tony Newton is one of the best in what he does! I didn’t get a chance to see Steve as he doesn’t live there anymore but it was really great! 7.-Furthermore, I remember that came out in the MySpace of David Bermúdez (your previous bassist) some photos that I saw in the backstage of Iron Maiden at the Twickenham Stadium 2010, could you speak a little bit of that experience? Surely that was to remind both the good times and old. It was a confusing time. I liked the show but I wasn’t at a good place mentally so didn’t really get a chance to relax and enjoy myself. I am still friends with the band members so it is of course always nice to see them again. 8 - Turn again to your stage: "The Man Who Would Not Die" and "Promise and Terror" were large disks obtained heavy criticism around the world and that in turn meant a new direction in the career of Blaze. Personally I think that "Blood and Belief" was not only the end of a first stage solo as Blaze, but a point and separate compositional level which gave way to new musical schemes with "The Man Who Would not Die and" Promise and Terror "." Now with the new album, and at the same time new training, think that we take step to a third stage in the Blaze era do you think that "The King of Metal" will mean a new twist your career, or on the contrary will mean a clear continuation in the Stylist of "Promise and Terror"? It is a combination of all my career with some new modern twists to it. Thomas Zwijsen is a young guy and working with him made it of course different than with my last two albums. I was able to put all my ideas into my music and find myself again and I think it has turned out really well! The songs are strong, powerfull but still melodic. I am very proud of these new songs and can’t wait to play them on tour. 9-Always you've characterized for being a real worker in this music, a genuine man of iron in terms of work and effort are concerned, never stop work, recording albums, touring around the world, also have time to make concerts with Wolfsbane, anyway... How can do so many things and continue to maintain the illusion to this Office after so many years and how you get combine your solo career with the career of Wolfsbane? Wolfsbane is a hobby. It has to fit around work. 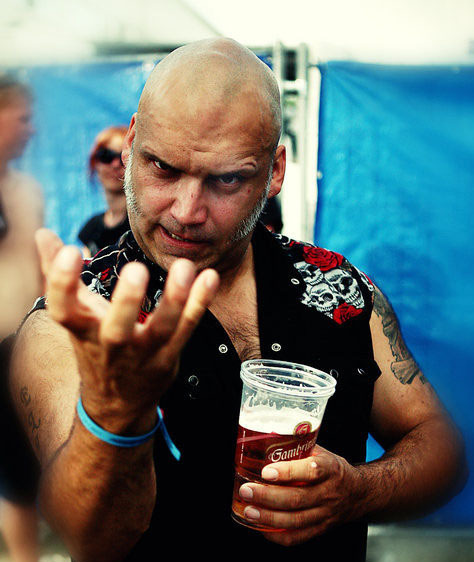 Blaze Bayley comes first! If there is no time for Wolfsbane, then there is no Wolfsbane that time. I plan far in advance and that way we try to fit it in but it is not always easy. That’s why we don’t do many shows with Wolfsbane, it takes a lot of organisation to get everyone together. 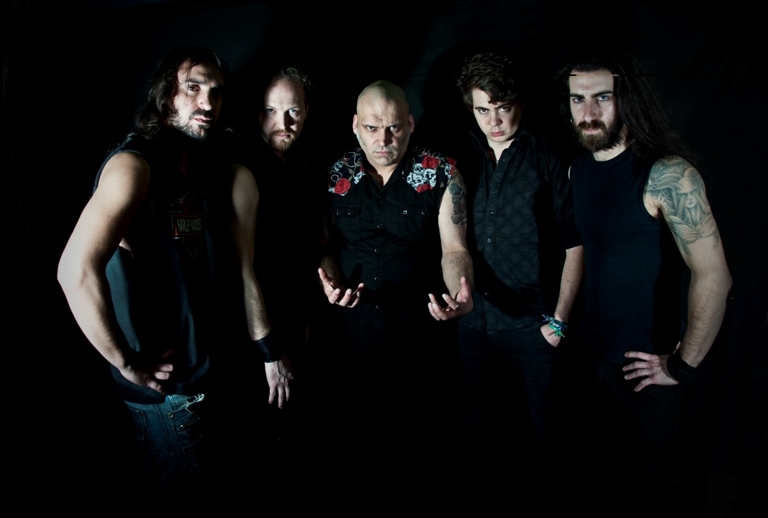 10-Do you have recently released a new album with Wolfsbane, "Save The World", could you talk to us from him, and even how has been your experience to back into the Studio with Wolfsbane? It was good! We did the writing over a long period of time and that was nice. I couldn’t spend much time being involved in the recording apart from the vocals. I think it has turned out well! 11-Approaches of the new line-up of the group, which has recently been confirmed, would have known how these kids and how you "impressed"? Claudio has worked with me for a few years now and he is just the best drummer I have worked with so far. He is like a machine. He was in my support band and told me he wanted to play for me and when Larry Patterson couldnt do the Brazilian tour, Claudio did it and he did a brilliant job so i kept him. I worked with Andrea Neri last year in the summer and he impressed me with his solo’s and personality. I did a guestperformance for Thomas Zwijsen last year in December and we worked well together on that and he had a lot of good ideas for a new album. Lehmann sent my management an email and we told him to record some things and he did a brilliant job at it. He recorded the bass on the album and i was very impressed with him so that’s why is also doing the tour. It was great, a good variation compared to what i normally do. It was very relaxing and a lot of fun! My wife was very pregnant at the time so Jase always went to the shows first and I went at the last moment and after the show, i walked of stage and went straight into the car. On the show from Worcester, my wife was in hospital because she was about to give birth. I called Jase asking to cancel the show but the venue really wanted me to go and offered to provide a motorcycle to drive me back to the hospital straight after the show. I didn’t want to go but my wife told me to go. It was not so far from the hospital. I did the show and got back to the hospital, 2 hours later my wife gave birth to my gorgeous daughter Alice. It was very exciting and luckily i had a free date after that. So I will always remember this tour! 13 - Just announce a tour together with Paul Dianno, do you tell us how this came about and if you are excited? in our view is something wonderful, having two together ex-maidens!We had the offer from the promoter in Russia and because I am not getting many shows there, i thought it was a good opportunity to meet more fans and to do more shows. So that’s why I have accepted. That’s the main idea behind it. 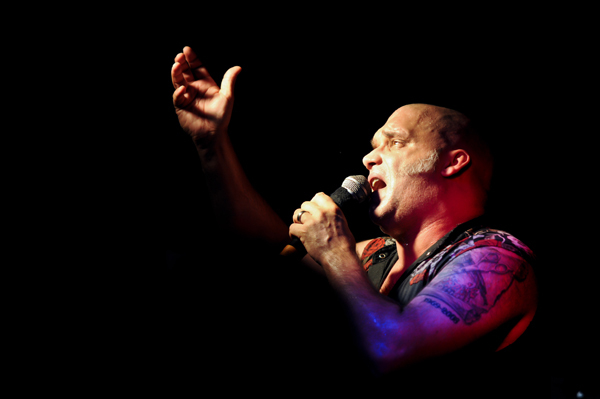 I will do it at places where I feel that they are not ready yet to see just Blaze Bayley and that we will attract more people together. I love it that i have shows in Spain. It was not easy to find a good promoter but we think we have him now and are very pleased that I can do 5 shows there. It has been a long time that i have been in Spain but I always love it there! 15 - We are going to return a few years back, I've always been curious to know your previous musical background not only Iron Maiden, but Wolfsbane, what bands you came to sing in the 80´s? What are your bands and favorite that always you have influenced, as well as to best voice of the metal of all time that has been for you? The best voice must be Ronnie James Dio. I saw his show and he made me want to become a heavy metal singer. Then i read an article in the newspaper where a band asked for a singer, no experience wanted. That was wolfsbane. So I didn’t play in a band before that. There are soo many bands that have influenced me. I was a big fan of Iron Maiden too. 16-Before finishing the interview, if I may Blaze, I would like to ask you some questions personally about your stage in Iron Maiden. Even I remember with much fondness presentation concert for "X Factor" in Granada in 1995, the expectation was maximum, 10 thousand fans enraged, Iron Maiden returned to Spain in 1996, with a spectacular concert at Jerez (Cádiz) with a sold out absolute again, the experience was even better, two years more late Iron Maiden returned with Blaze to Spain in the presentation of Virtual XI What memories do you have of those concerts? What you remember of the Spanish fans? Many people speak of a dark time for the heavy metal in the early 1990s, but Iron Maiden managed to gather thousands of fans at each concert on their Spanish tour. Can you tell us any special anecdote? The fans are great in Spain! 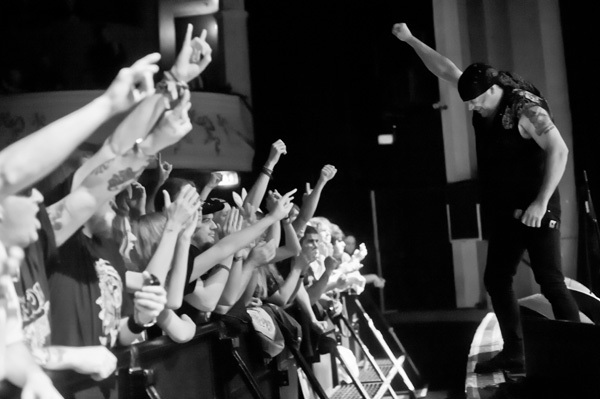 You can feel there support when you are on stage and it just makes you perform even better. It is great when a show sells out of course. Iron Maiden is a legend in heavy metal and I think they will never struggle to fill arena’s. I can’t remember a special anecdote, the whole time was just amazing for me and I loved every moment from it. 17 - Something on a personal level, if you want, in this new life of yours, you'll overcoming about your deceased wife Debbie, (we give our condolences) surely a wonderful person. Finally, do this new life you dad, how the carry? a little girl right?, congratulations Blaze! Yes, thank you! It is not easy to leave my wife and little girl behind for a few weeks but I think about them all the time on tour and want to do my best for them. My wife is my manager now so she can’t complain if I am away for too long because she booked me lol. It is great to work together as a team with her because it means i don’t have to deal with all the finances and organisation. I can focus on being a singer and doing what I do best. When I am back home I spend most of my time playing with my dog and my baby and relaxing with my wife. I know my daughter is in good hands when I am on tour because my wife looks after her all the time. 18 - Already ending, we wanted to thank you for granting us this time to all the Spanish fans, of maiden.es, we enjoy your music and your voice. do some words for all your followers of Spain, that will be waiting with eagerness to hear the new album "The king of Metal" and ultimately see this interview published in the magazine of maiden.es? Thank you soo much for all your support over the years! It is always a great pleasure to perform in front of Spanish fans and I look forward soo much to coming back to Spain! I hope you will love my shows and my new album. It is available on my webshop and will be released officially on the 20th of May. 19 - Again thank you for all Blaze, and thank you for realizing one of our dreams: to talk with you. We hope that we meet and talk in future interviews or future meetings. THANKS TO MIGUEL CADIZ, ELINE AND OF COURSE, BLAZE!